Got kids? Got bikes? Then get yourselves to the New Forest in Hampshire. In fact, even if you haven’t got bikes, get yourselves there and hire some. And if you can’t ride a bike… learn! We always knew the New Forest was a wonderful place, but something about this trip has just had us beaming from ear to ear. I don’t know how many times we uttered, as cycling along “this is just amazing isn’t it?”…. “this is stunning isn’t it”…. 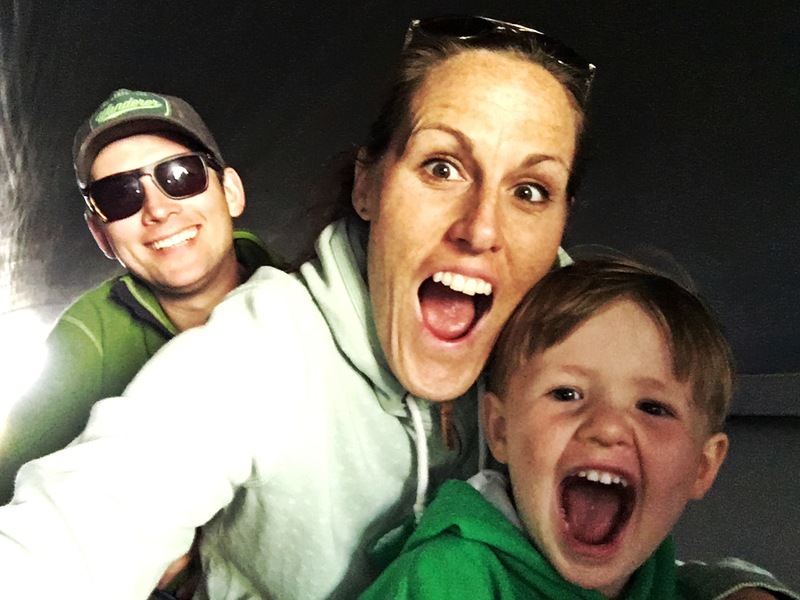 “this is just perfect for families isn’t it?”…. “gosh, this is just incredible”. It really was spectacular (there I go again). 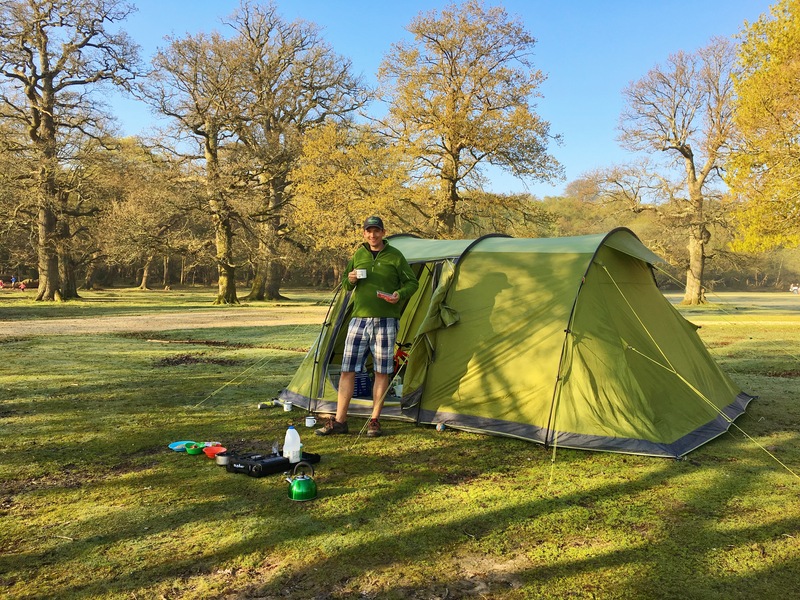 There are so many different places to stay in the New Forest, but we opted for Ashurst on the north-eastern edge, just 4km from Lyndhurst, which is the main town within the forest. We stayed at Ashurst Campsite, which was wonderfully natural, with unplanned pitches in amongst the trees and with ponies and cows roaming throughout the campsite. It was a perfect place for kids to run wild and be free. Apparently it has up to 280 pitches, but there can’t have been more than 15 campers there during our stay – one of the perks of going so early in the camping season. 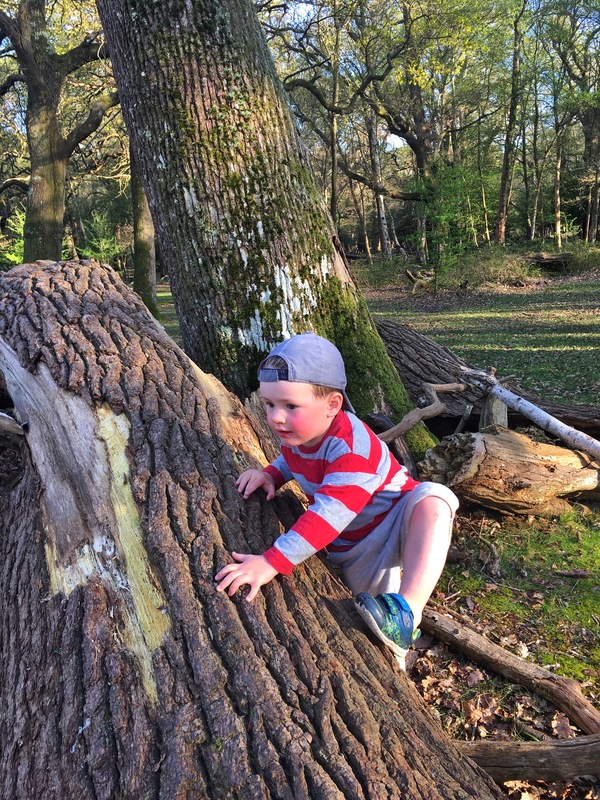 Oskar loved it; he spent his days playing with the other children and collecting sticks, hiding and seeking amongst the trees and clambering over an enormous fallen tree on the edge of the grounds of the campsite. It was ‘natural’ but also well managed and with good washblock facilities, so good for families. 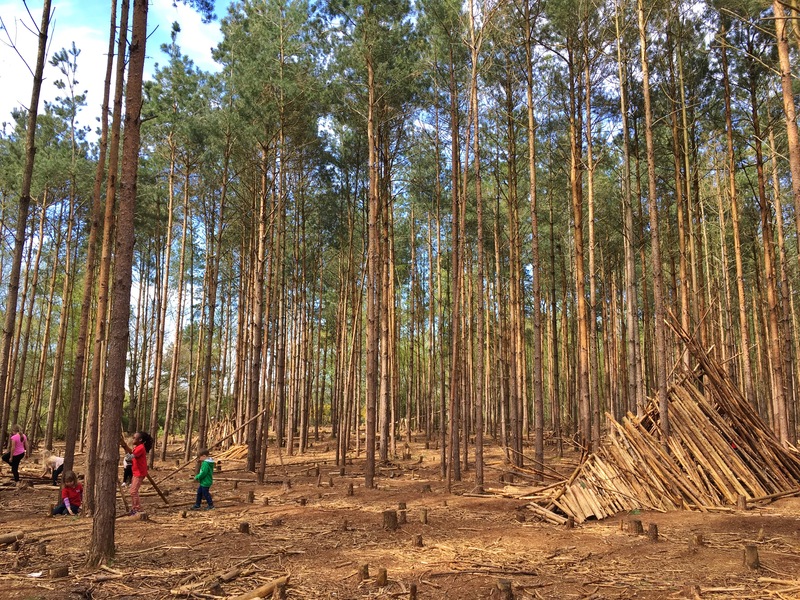 On our first day in Ashurst we pitched our tent and set up camp and then headed immediately out cycling into the forest. 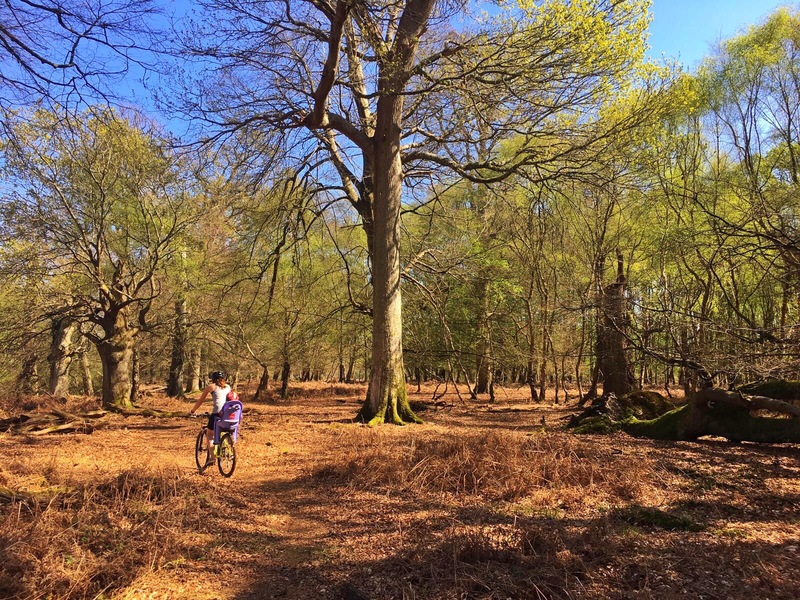 We stayed within the area of forest around Ashurst and just lost ourselves on the cycle trails – going in any direction that took our fancy, confident that it was a relatively small area so we wouldn’t get lost. 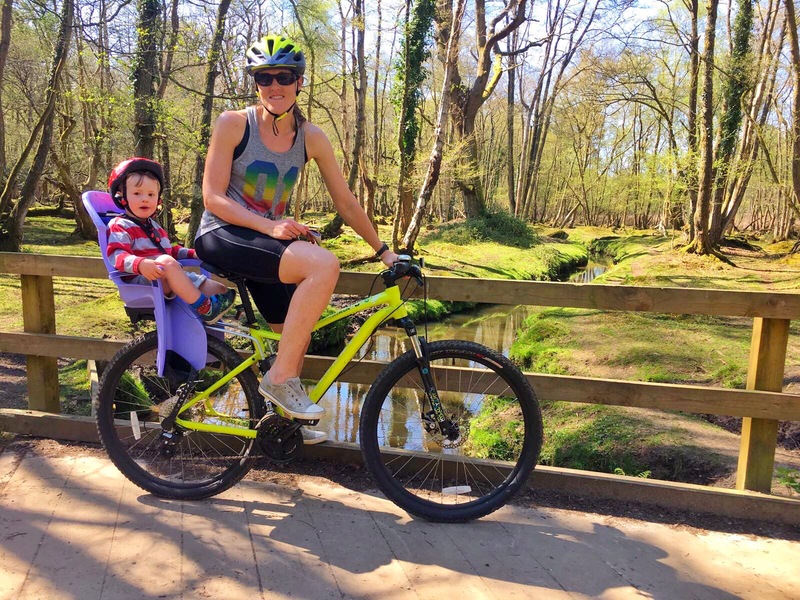 The paths are wide and flat (with the odd gentle hill) and really are perfect for family cycling, whether you have a little one on the back of your bike or some little novice cyclists in your peloton. The first day was a great little introduction to the forest and it was great to get out and explore. For our second outing into the forest we decided to purchase a cycle map from the campsite wardens and actually plan ourselves a route (however if you are a little more organised than us you can download the map before you go). 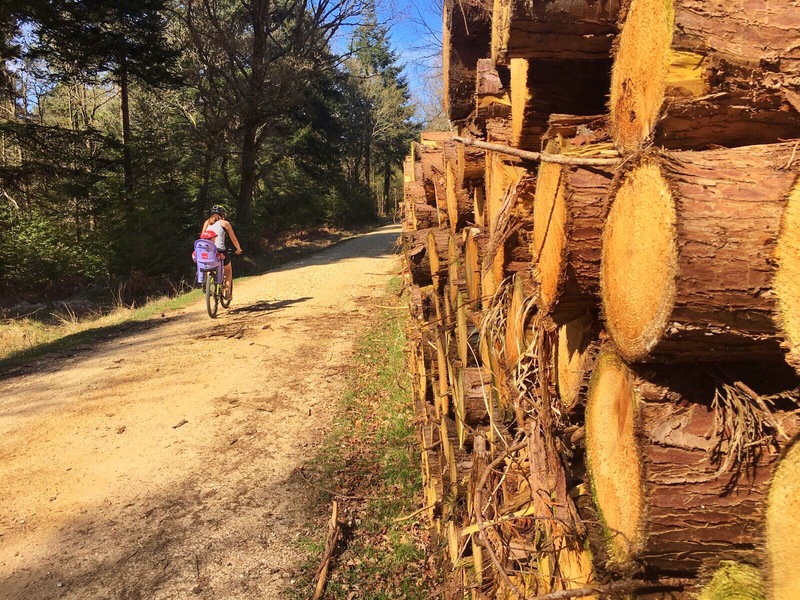 We cycled the 4km into Lyndhurst (there are cycle paths connecting the two), and from there headed into the forest to the south-east of the town, where there was a much larger network of cycle trails to explore. We followed our rough route going clockwise around the pocket of forest to experience as much of it as we could and we mostly kept to this, apart from a minor planned detour entirely off the trails. This made for a very interesting hour, with some serious off-roading, some fairly undulating terrain and lots of roots and fallen trees to navigate. I won’t lie – at one point we were pretty lost, but we followed our noses end emerged back onto a cycle trail having had a great little adventure and seen parts of the forest that many others may never experience! We took the day really easy, having regular stops for Oskar to get off the bike and have a run around, eat snacks, build dens and generally get up to mischief. But at the end of the day we had still covered a good 20km, which was pretty satisfying. 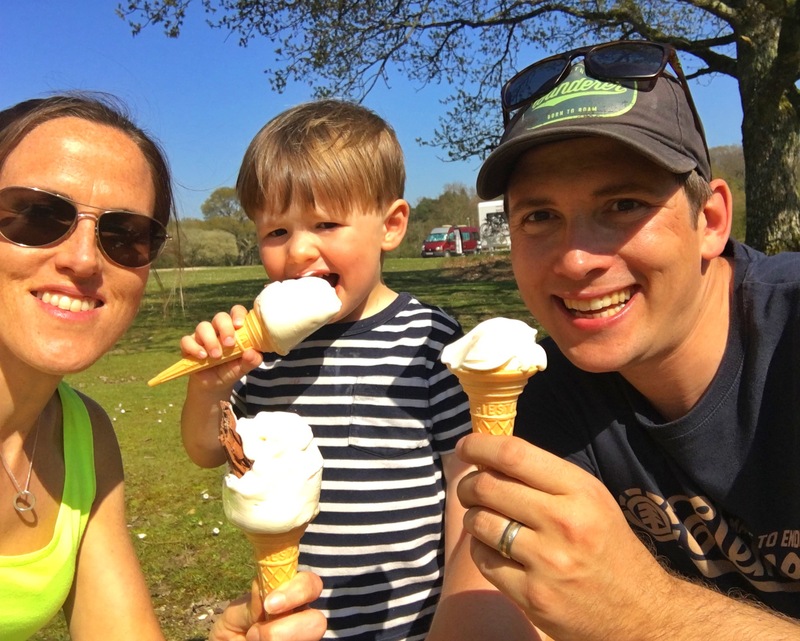 We had a cheeky ice-cream in Lyndhurst as a treat and then whizzed back along the cycle path to our campsite to chill and enjoy some late afternoon sun. 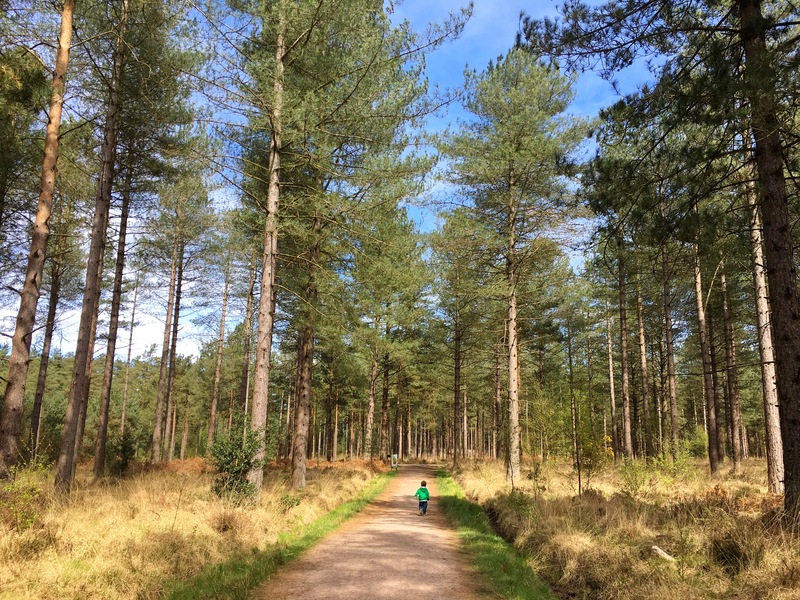 We didn’t really know what we were going to do on our third and final day, but another happy camper suggested we go to nearby Moors Valley Country Park, which they said was free and had loads of activities for kids. With Oskar having spent much of the last two days on the back of a bike, we decided this would be a perfect option and we could take him there to thoroughly wear him out before driving home. 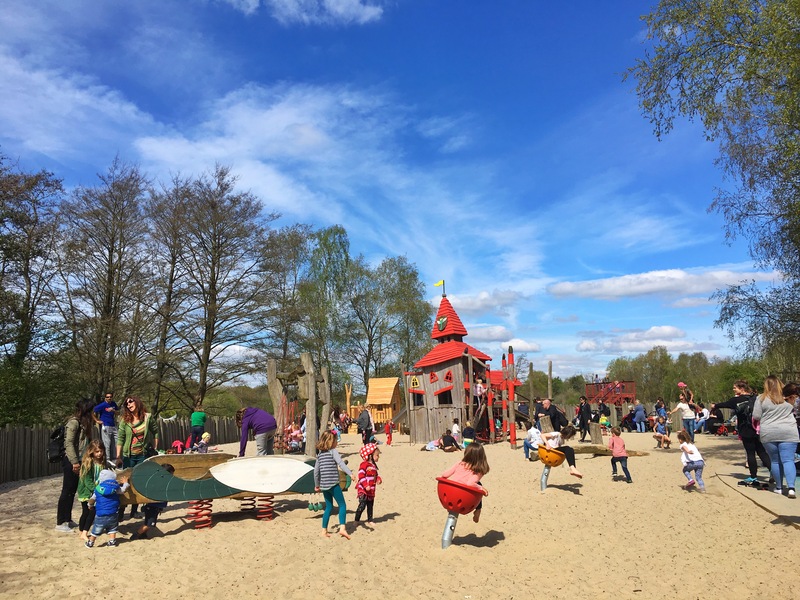 After a lazy morning filled with sunshine, cups of tea/coffee and some pretty tasty bacon and egg sarnies, we packed up and headed to Moors Valley Country Park. All we can say is that it FAR exceeded our expectations, and had we realised how brilliant it would be, we probably would have headed off a little earlier! Parking was £8, but that was the only cost for the whole day and so totally worth it. First of all we spent some time in the adventure playgrounds, which were awesome and pitched at different ages/levels so that everyone felt challenged. We then headed off on the Gruffalo walking trail through the forest, which was so simple but Oskar absolutely loved it; it really grabbed him. He was over the moon to find not only a massive wooden Gruffalo but also Gruffalo’s Child at the end of the trail. 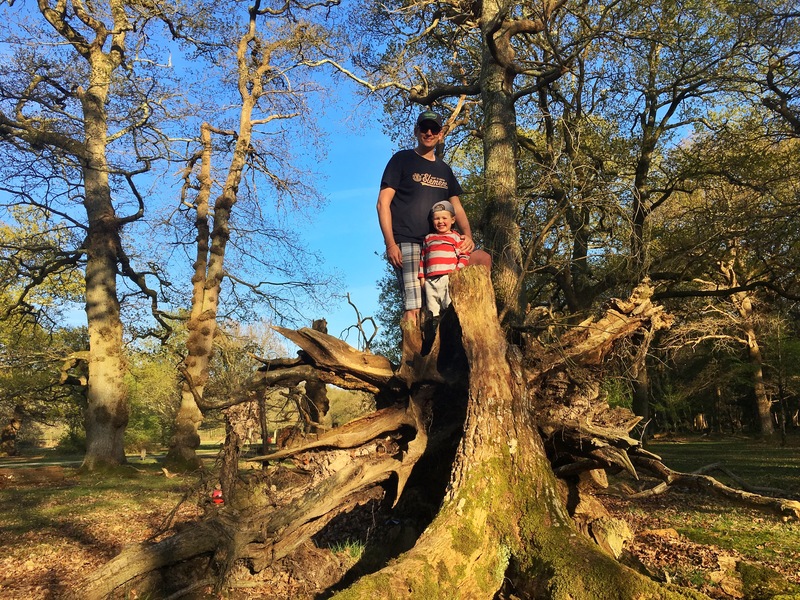 There is a lovely lake in the country park with a tarmacked path all around it, which is perfect for little people to cycle or scoot around and there’s also sorts of other brilliant activities like den building, adventure trails in the forest, and cycle trails. However, for Oskar the highlight was the miniature steam railway. 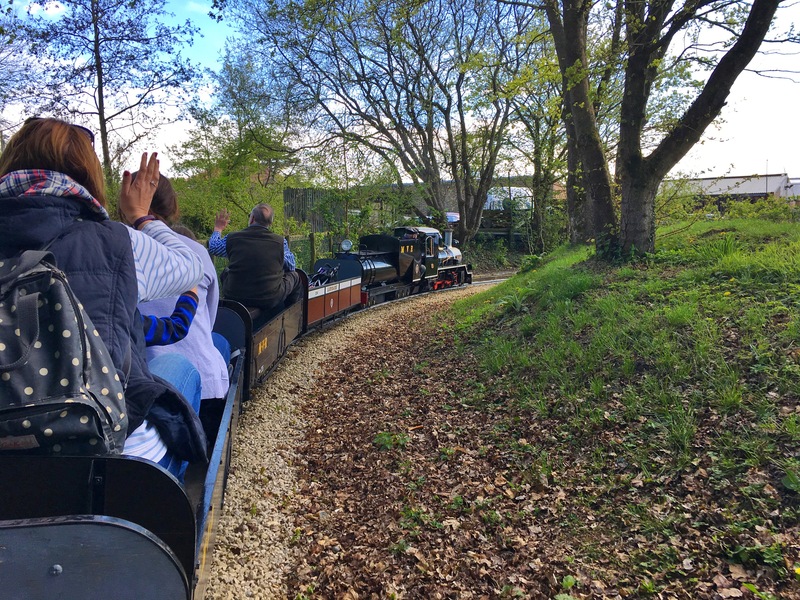 Now, as a parent of a three-year-old boy I have been on my fair share of miniature railways, but this one was by far the best! The effort that has been put into it is fantastic; you even stop at another station, alight the train, cross a bridge going over the tracks and wait in a little waiting room for your return train – it was super cute! Genuinely we could have easily spent a whole day here – it was absolutely fantastic. But the time came to leave and start the journey back home. It had however been a really great addition to our already brilliant weekend and we were really pleased with how our weekend had unfolded. Once again, we had but scratched the surface of this lovely area, but we’d had a ball and had experienced three pretty jam-packed days. 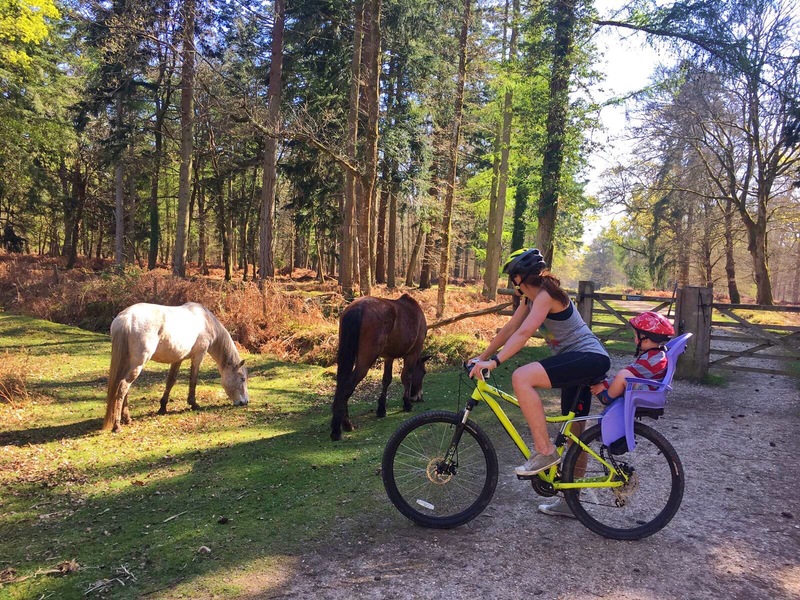 The New Forest is such an easy destination for families and we couldn’t recommend it highly enough. Thanks for having us Hampshire and for being another addition to our X-County Challenge as well as marking another great campout as part of out 17 in 17 family campouts! Sounds fun even for a non camper like me! 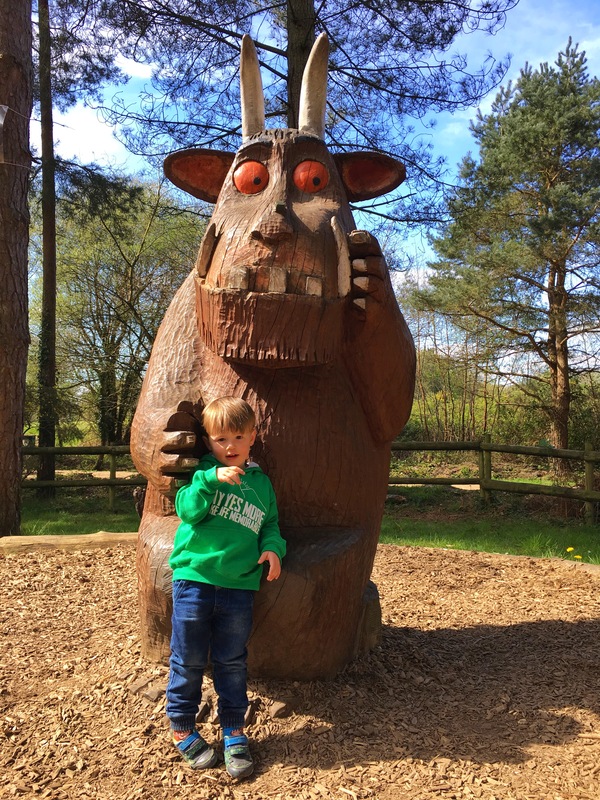 The gruffalo park looks amazing, Soph would totally adore it there as ‘gruffy’ is one of her favourites!